The first day’s play at the US Open at Merion Golf Club hasn’t even been completed yet, and already Merion’s wicket baskets have moved from quirky to notorious. In scenes reminiscent of Tiger’s flag stick-to-water episode at The Masters (just without the now infamous incorrect drop), Lee Westwood suffered the misfortune of striking a Merion basket on the 12th hole, cannoning off and enduring a double bogey as a result. He had been tied for the lead at the time so we can only hope it doesn’t come back to haunt him on Sunday. In case you’ve missed it, Merion Golf Club uses wicker baskets instead of flags and the USGA have stuck with them for this year’s US Open. Back in 1950, the year Ben Hogan hit a famous 1-iron approach to the 18th to secure par before winning the next day’s play-off, their decision went the other way. That year the USGA opted for flags instead of baskets because, as Richard Tufts wrote, “they are different…there will be some criticism if the baskets are used.” We can now be certain they’ll be some criticism again. Personally, I like the fact that The US Open is celebrating one of Merion’s most quirky traditions. Called “Standards” due to the lack of an actual flag, the wicker baskets have been used for nearly 100 years, though the origins are still open to debate. One story goes that Hugh Wilson (the architect of the East Course at Merion) came up with the idea whilst researching golf courses in England. 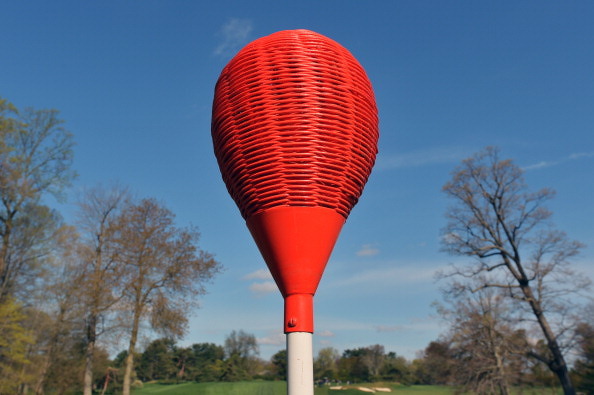 Apparently, Wilson saw local shepherds using their herding sticks with wicker baskets holding their lunch, and decided to introduce the same concept for flag poles at Merion – but this hasn’t been substantiated. Five-time host of The US Open, Merion is a connoisseur’s favourite. Here, events etched into the annals of the game have unfolded: that aforementioned Ben Hogan 1-iron; Bobby Jones’ Grand Slam, and countless moments from US Amateur Championships. For me, whatever the risks of a ricochet, using the baskets is a respectful nod to this club’s place in history. I am not sure the modern tour professional will look on it so kindly, not least for the fact that the baskets won’t show them any signs of the wind up at the green, but their caddies will just have to earn their money this week. One player you can be certain will love the wicket baskets will be the winner. As a memento, they will be presented with one – alongside a very healthy cheque and their own place in US Open history. Beyond Merion, I know there are other celebrated quirks at clubs across the world – the potential risk of being stranded by the tide at Royal West Norfolk GC, being one example. Perhaps the peculiarities of wicker baskets on a golf course are familiar to you already, or you know of other unusual traditions. As always, your thoughts are welcome. For now though, enjoy the US Open…wicker baskets, ricochets and all!